When asked which screen recording software for Windows 10 is the best, different users may have different ideas. Undoubtedly, to make your screen capturing experience delighted, it is necessary to look for a best screen recorder with diverse functions. Generally speaking, it is a waste of time trying each one blindly, especially when you are in emergency. Why not follow this screen recorder review to know both merits and drawbacks of those best Windows screen recording software clearly? Here is the list of 5 top-leading screen recorders for you to capture any screen activity on your Windows 10 smoothly. Proved as one of the most professional screen capture, Joyoshare Screen Recorder can record all screen video and audio activity, like streaming movies, self-demonstration, live chats, video games, online radio, music games, etc, for Windows 10, outputting multiple supported formats and devices. For video, there are multiple options, such as, HD MP4, AVI, FLV, SWF, WMV, MKV, MOV and other common formats, while for audio, it can output MP3, AAC, WAV, FLAC, M4A and M4B. On the one hand, Joyoshare Screen Recorder can be regarded as an advanced screen video capturing tool to record any desktop activities for Windows 10. On the other hand, it can perform as an independent audio recorder to capture any sounds. There are flexible settings that take different users requirements into consideration. As a result, you have chance to customize your screen recording, for instance, selecting capturing area, choosing output format, taking screenshots, creating a scheduled task, editing ID tags, etc. Of course, it allows you to upload and share your recording to YouTube so that anyone who is interested in your recording topic can view it directly. 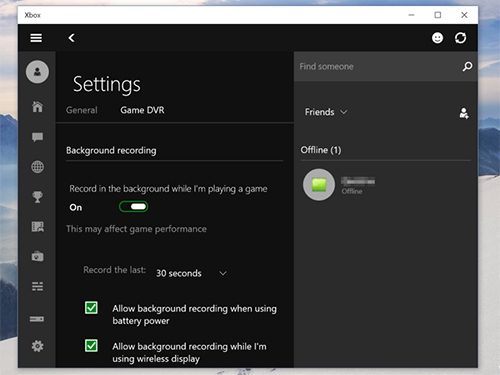 It seems like that there are just a few users being aware of a fact that Windows 10 is equipped with a built-in free screen recorder, which is called Xbox DVR. It is needless to stress that for one thing, you can use this free screen recording software for Windows 10 directly without downloading and installing a third-party app. For another, as a built-in recording tool, Xbox DVR is safe enough to use so that you don't have to worry about any privacy information leakage. With its intuitive interface, it is easy for new beginners to operate. Meanwhile, Xbox DVR will do a good job for you. You may wonder how it works. Similar to other simple screen recorder, it is developed without a complicated editor. To capture a screen, go straight to press Windows 10 Key + G to launch it. As a matter of fact, Xbox DVR gives due weight to record gaming videos, but you can also apply it to capture your screen, which requires a video card intending to make screen recording via Game DVR. Besides, please note that it doesn't allow you to record the desktop together with inability to result capturing video in high resolution. 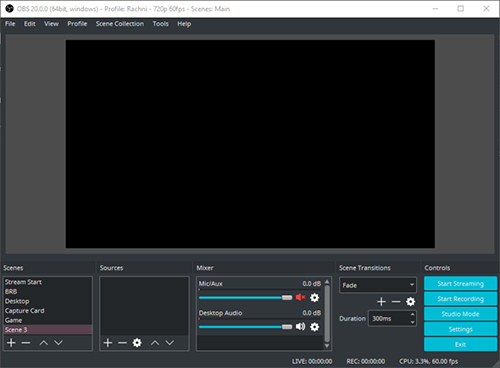 As a free and open source recording tool, OBS Studio is widely accepted by plenty of users who have thought of recording any screen activities for Windows 10 with high efficiency. Because of its advantages in capturing the desktop videos as well as providing an excellent platform for live streaming, OBS Studio is regarded as professional recording software, which means upon you complete a recording task, you can stream your screen recording from OBS Studio to YouTube, Facebook, Hitbox, etc. In addition, what deserves to be talked about is that there is no restriction on the length of recording videos. Briefly, you can capture any screen activities for Windows 10 stripping yourself from time limitation. 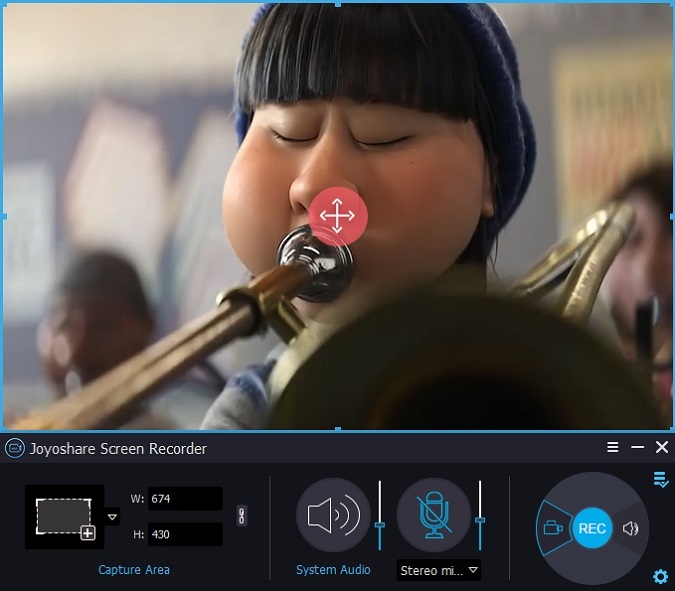 In terms of recording screen video, OBS Studio includes full support for capturing in MP4 and FLV formats by making use of your PC's GPU for high-quality streaming. Meanwhile, you are allowed to output recording in your PC for later playback. Apart from what has been mentioned, there are some special features designed for video recording, for instance, Push-to-Talk mode, Picture-in-Picture mode along with Custom watermarks. 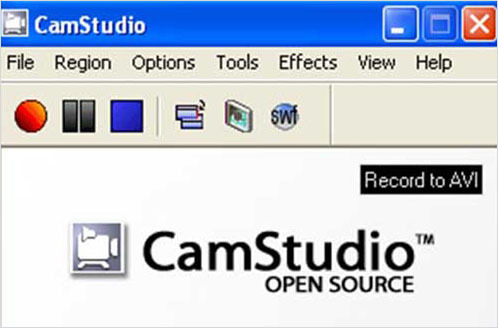 Doing well in recording not only screen videos on Windows 10 but also audio tracks going on your computer, CamStudio has access to output these capturing files in high quality. It is the built-in SWF producer that is capable of converting output AVI video recordings to a streaming Flash videos or SWFs. Moreover, it is available to add anti-aliased screen captions to capturing at once. With the intention of making a personalized screen recording video, CamStudio has facility to annotate video carrying out the way of using a small webcam movie as screen-in-screen video. Though you can use this capturing tool with no cost, it doesn't mean there are just some basic recording functions. CamStudio is specially designed with a customized cursor, which can be hid as long as you would like to. Except that, it permits you to create a video recording to answer the FAQs and make files with smaller size. However, as the saying goes, "Nobody is perfect", CamStudio also has its shortcomings. Sometimes, when you record a video, the audio may fails to be synced with video. Moreover, the output videos cannot be compatible with a number of browsers. 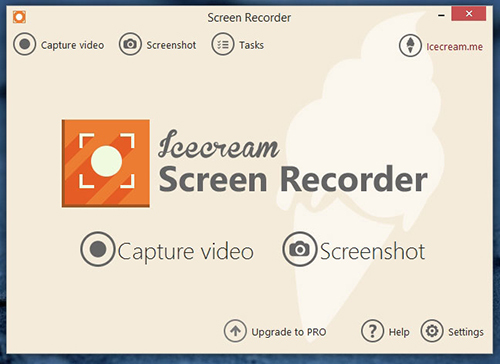 Act as a simple but powerful screen capturing tool for Windows 10, Icecream Screen Recorder is good at satisfying your needs and bring you good experience, which allow you to record any area of the screen to make either a video or a screenshot graphic capturing. With a user-friendly and tidy interface, you can operate the whole screen recording for Windows 10 without referring to a guide. If you have a try, you will find that Icecream Screen Recorder can enable you to add hotkeys, which can at the same time concentrate on your mouse. During your recoding process, you are entitled to zoom in and out owing to its well-designed zoon tool. What's more, by using this screen recording software, you can feel free draw, outline, or add texts and arrows to your captured screen video as well as webcam video. To some extent, one feature you may like is that it supports your own watermarks, which is convenient for you considering you don't have to edit watermark any more. From the above comparison, it is easily seen that all that mentioned 5 screen recording software for Windows 10 are similar in basic recording features, but vary in some outstanding options. Certainly, you will be favor of one of screen recorders for Windows 10, which will benefit you tremendously if wisely and correctly take advantage of its merits. Then, it is high time that you enjoyed your screen recording!